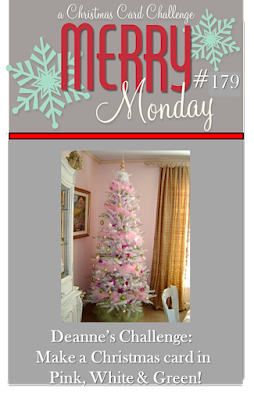 Merry Monday Christmas Challenge blog is having a "Pink, Green, & White" challenge. This is my second card for that challenge. Classes' "Holiday Style" class. The theme was clean & simple cards. I don't think you can get much cleaner & simpler than this! Because I like the insides of my cards to be "pristine," I did my work on a separate panel, that I then adhered to my A2 card base. But you could easily do this right on the card base, as Laurie demonstrated. I masked off the lower portion of my panel at a diagonal with some low-tack painter's tape. Then I blended Cracked Pistachio & Evergreen Bough Distress inks, to create an ombre effect. I removed the tape, and scored along the top line of my inked portion. I flipped the panel over, and scored on that line again, to make the line raised on the front, then scored every 1/2". For my snowflakes, I used 3 of the stamps from Hero Arts' "Joy Snowman" set. I stamped them in Hero Arts Bubble Gum ink on white cardstock, then cut them out with the coordinating dies. After stamping my greeting, from WPlus9's "Pretty Patches: Christmas" mini set, in Versafine Onyx Black ink on my panel, I glued down my snowflakes. Finally, I adhered my panel to my card base. Like I said, you can't get much simpler! Craft Your Passion: "Anything Goes"
Wow! I love the clean lines and simplicity of your card. I haven't tried the ombre technique yet, you've inspired me to. Thank you for joining us at TTCRD!